Way back when, I used to be on the design team at Sweet Stampin' Challenge Blog. A few weeks ago, Abi asked me if I would guest Design for her last challenge... Sparkle and Glitz. Well, who can resist a bit of glitter? Be sure to pop over for more inspiration and to join in. 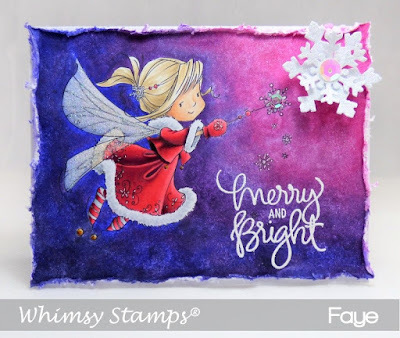 This gorgeous girl is from the latest release at Whimsy Stamps. UK Peeps, you will be able to get her at Dies to Die For shortly. I'm out and about this weekend, I will be demonstrating with Copics for Dies to Die For at Sincerely Yours in Leigh on Sunday, if you are local, come and say hi. What a stunner Faye, thank you so much for coming back for this week. I had such a great inspirations from you for being a blog mum, bet you never imagined SS still going strong 9 years late! We should all get together & have an SS reunion copic course lol! It's so scary to think of Sweet Cheeks & the Boy Wonder being so grown up now. Thank you again my lovely, for coming back & for bringing me to SS in the first place. Gorgeous - love the way the pretty background makes the image pop. Beautiful! Fabulous card Faye, love the stamp and your colouring is, of course, amazing! Didn't realise that you were a part of Sweet Stampin' in the past we learn something new every day. So pleased you joined in to make our Abi's last challenge something special, she deserves an amazing send off!